Ireland and Leinster flanker Jordi Murphy has been ruled out for six to nine months because of a knee injury, the IRFU has announced. Murphy, 25, injured his cruciate ligament during Ireland's historic win over New Zealand on Saturday. The flanker, who scored Ireland's first try in the 40-29 victory in Chicago, will miss this season's Six Nations. Also called up are uncapped Munster pair Jack O'Donoghue and Darren Sweetnam, and Leinster's Dan Leavy, who could also be in line for his first Ireland appearance. Connacht full-back Tiernan O'Halloran and Munster prop Dave Kilcoyne have also been added to the squad. 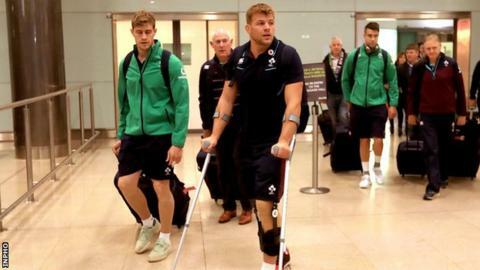 Flankers Sean O'Brien and Peter O'Mahony were held back from the trip to the United States in order to build match fitness with their provinces but both are expected to feature this weekend. Ulster fly-half Paddy Jackson is included in the squad after missing the trip to Chicago for personal reasons, while Keith Earls is available again after a serving a two-match ban following his sending off against Glasgow. Johnny Sexton came off in the second half of Ireland's first win over the All Blacks, but team manager Mick Kearney said the Leinster fly-half is not an injury concern. "He came off purely because of cramp but he's fine," said Kearney. Nigeria-born Adeolokun, 26, came to Ireland with his family as a 10-year-old and signed for Connacht in 2014 after playing for Trinity College in the All-Ireland League. Ireland wing Andrew Trimble said the team had to overcome mental doubts to end their 29-game winless run against the All Blacks. "You are wrestling with yourself mentally to go out and try to convince yourself you are good enough to do it," said the Ulster star on Monday. "Even when we had the lead there were doubts that it could unravel. In the back of your head you are going 'hang in, please, hang in' for 40 minutes." Trimble admitted that the Ireland players are still "pinching ourselves" after earning their first win over New Zealand in 111 years of trying. "It still feels pretty special. It still hasn't fully sunk in really, what we have achieved." However, Trimble says an All Blacks backlash is inevitable when the teams meet again in Dublin on 19 November. "We did so much homework for the game. We're going to have to do even more hard work, because New Zealand are going to produce a bigger performance." Ireland squad for Canada game: Niyi Adeolukun (Connacht), Finlay Bealham (Connacht), Rory Best (Ulster) capt, Joey Carbery (Leinster), Sean Cronin (Leinster), Ultan Dillane (Connacht), Keith Earls (Munster), Tadgh Furlong (Leinster), Craig Gilroy (Ulster), Cian Healy (Leinster), Jamie Heaslip (Leinster), Iain Henderson (Ulster), Robbie Henshaw (Leinster), Billy Holland (Munster), Paddy Jackson (Ulster), Rob Kearney (Leinster), Dave Kilcoyne (Munster), Dan Leavy (Leinster), Kieran Marmion (Connacht), Luke Marshall (Ulster), Jack McGrath (Leinster), Luke McGrath (Leinster), Conor Murray (Munster), Sean O'Brien (Leinster), Jack O'Donoghue (Munster), Tiernan O'Halloran (Connacht), Peter O'Mahony (Munster), Jared Payne (Ulster), Garry Ringrose (Leinster), Donnacha Ryan (Munster), John Ryan (Munster), Johnny Sexton (Leinster), CJ Stander (Munster), Darren Sweetnam (Munster), Devin Toner (Leinster), James Tracy (Leinster), Andrew Trimble (Ulster), Josh van der Flier (Leinster), Simon Zebo (Munster).